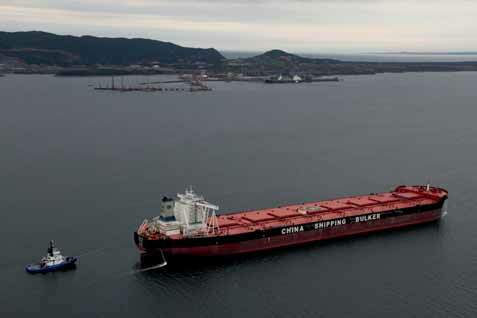 On 16 October, Cliffs Natural Resources Inc. (Cliffs) and the Port of Sept-Îles, announced that for the first time in North-America, a Chinamax type vessel will be loaded in the Bay of Sept-Îles, and will transport 300,000 metric tonnes of iron ore concentrate from Cliffs’ mine in Bloom Lake, to Asia. “We are witnessing a historical turning point today: the opening of our port to the next generation of ore vessels of the planet.We must congratulate the initiative of our partner, Cliffs Natural Resources, who made this possible,” said the president & CEO of the Port of Sept-Îles, Pierre D. Gagnon. The CSB Years is a ‘Chinamax’-type bulk vessel, with a loading capacity of 330,000 metric tonnes, measuring 330 metres long and 31.3 metres high. The CSBYears was registered in Hong Kong in January 2012 by the company Nianhua Shipping SA. Cliffs Natural Resources Inc. is an international mining and natural resources company. A member of the S&P 500 Index, the Company is a major global iron ore producer and a significant producer of high-and low-volatile metallurgical coal. Cliffs’ strategy is to continually achieve greater scale and diversification in the mining industry through a focus on serving the world’s largest and fastest growing steel markets. Driven by the core values of social, environmental and capital stewardship, Cliffs associates across the globe endeavor to provide all stakeholders operating and financial transparency. North America and an iron ore mining complex in Western Australia. In addition, Cliffs has a major chromite project, in the feasibility stage of development, located in Ontario, Canada. Boasting a variety of state-of-the-art facilities, the Port of Sept-Îles is a leading iron ore port in North America, with an annual volume of nearly 30 million tonnes. Sept-Îles’ port facilities play a vital and strategic role in the operation of many businesses from the region’s primary sector. The port’s annual economic impact is estimated at nearly $1 billion, with some 4,000 direct and indirect jobs.Through its activity, the Port of Sept-Îles therefore remains a significant source of wealth creation in Quebec and the rest of Canada.